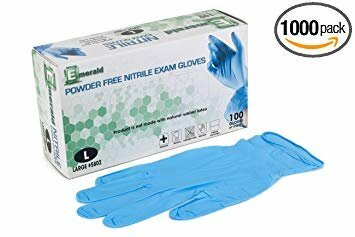 Emerald Nitrile Powder-Free Exam glove provides outstanding comfort at an outstanding price. This latex free, powder-free textured glove is best for tactile sensitivity. It guards against hand fatigue and has superior tensile strength. It is chemical resistant and unrivaled against blood borne pathogens and other body fluids. Emerald Nitrile gloves also sport a beaded cuff for easy donning. 100 gloves per dispenser box . MEDICAL/DENTAL GRADE - It is chemical resistant and unrivaled against blood borne pathogens and other body fluids. Before gloves can be marketed to hospitals and medical institutions, they must undergo a series of tests conducted by the Food and Drug Administration (FDA) to ensure their durability. POWDER FREE - These disposable and convenient gloves leave no residue on hands after use. LATEX FREE - Non-allergenic and non-irritant. Superior to latex gloves in providing protection against petroleum-based products. BEADED CUFF - The beaded cuff for easy opening, quick donning, and fast removal.FINGER TEXTURED - Best for tactile sensitivity. Also, it guards against hand fatigue and has superior tensile strength. If you have any questions about this product by Emerald Brand, contact us by completing and submitting the form below. If you are looking for a specif part number, please include it with your message.